This candle is very strong. Very herbal and slightly pungent. Heavy on the Thyme. Our male customers seem to gravitate to this one. It has taken on a life of its own as the perfect scent to eliminate fish and other odors. Light before you start cooking, and by the time you have cleaned up, the fish smell is gone! Mottled green. Our 4" Thyme Eucalyptus burns for approximately 100 hours. Our 6" Thyme Eucalyptus burns for approximately 200 hours. Our 9" Thyme Eucalyptus burns for approximately 300 hours. 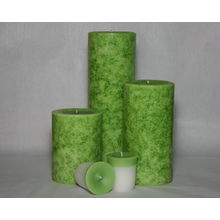 Our Thyme Eucalyptus votive burns for approximately 15 hours.